Get immediate savings by booking a Ljubljana travel package. Just pick out your favourite options and let Expedia do the rest. Secure a travel package on Expedia and save up to 15%*. With more than 400 partner airlines and 321,000 properties worldwide available on our global database, you'll have your dream holiday in no time! Getting fired up about your trip to Ljubljana? Need some tips about what to see when you arrive? That's what we're here for! You're going to be surrounded by noteworthy sights, including Dragon Bridge and St. Nicholas Cathedral. If you really want to make the most of your stay, also take a look at Ljubljana Castle and Triple Bridge. Public squares can tell many stories. Amble across well-trodden footpaths and try to find some clues to the area's past at Town Square. Adventurers in this destination have heaps of options. Over the years, many trailblazers and great minds have studied within the lecture rooms of University of Ljubljana. 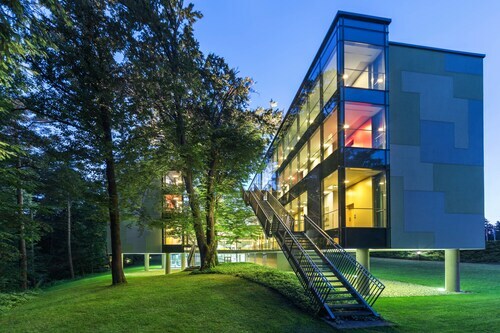 Learn about its history and achievements, and walk through the campus during a guided tour. Still got time to spare? History is full of lessons. Soak up the knowledge and better acquaint yourself with times past at National Museum of Slovenia. Holidays are pretty cool to start with. But taking advantage of the wonderful activities on offer definitely makes them better! For a comprehensive list of activities, check out the Ljubljana things to do page. With roughly 55 accommodations in Ljubljana, securing the ideal room to spend your evenings in Slovenia's capital city won't be a problem. Expedia is the home of the greatest luxury getaways and cheap holidays. Valet parking, pillow-top beds and high-quality furnishings are just some of the things you can expect upon your arrival at the Antiq Palace Hotel And Spa (Gosposka ulica 10) and the Lesar Hotel Angel (Gornji Trg 7). Reserve a room now for a taste of the good life! The Grand Hotel Union (Miklosiceva 1) and the Hostel Celica (Metelkova 8) have decent ratings if you'd like something less expensive. Nobody likes standing around at the airport. But it's a small price to pay when you think about the adventure that's in store! Based 13 miles (21 km) north of Ljubljana, Joze Pucnik Airport (LJU) is the nearest terminal. Festooned with statues of a Slovene national emblem, this early 20th-century bridge is one of the city’s most recognizable monuments. Decorated with works by esteemed Italian artists, this 18th-century cathedral stands tall in the heart of Ljubljana’s atmospheric Old Town. At the entrance to Ljubljana’s Old Town is a square framed by architecturally impressive landmarks and host to varied cultural events. Go on a guided or self-guided tour of this beautiful government building for its centuries-old and contemporary art and fascinating stories about Ljubljana's past. Discover an interior decorated with art by local and Italian artists at this Baroque-style church that overlooks Ljubljana’s main square. Admire the architectural talent of Jože Plečnik at this library, which houses a collection of over 1 million books, manuscripts and visual and multimedia artifacts. Study art installations, explore a botanical garden, visit a history museum and play lots of sports at this vast city park. Visit an iconic crossing in the city, a balustraded bridge that was known for its butchers’ booths and shoemakers’ shops in earlier times. 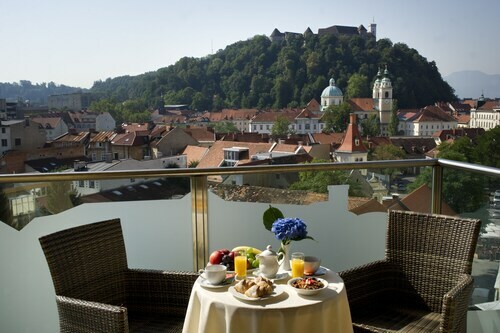 Located in Ljubljana City Centre, this hotel is within 1 mi (2 km) of Dragon Bridge and Ljubljana Castle. Preseren Square and Franciscan Church of the Annunciation are also within 5 minutes. Ljubljana Station is 7 minutes by foot. 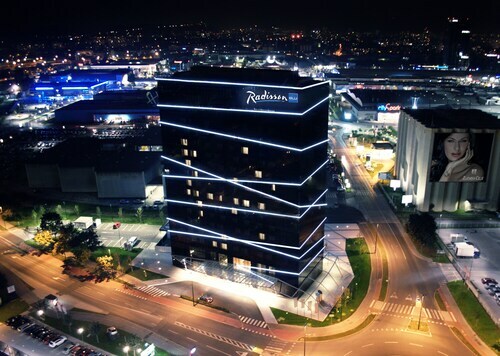 Situated in the business district, this hotel is 2.3 mi (3.8 km) from Metelkova and 3.1 mi (4.9 km) from Ljubljana Castle. GR- Ljubljana Exhibition and Convention Centre and Dragon Bridge are also within 3 miles (5 km). Located in Ljubljana City Centre, this hotel is within 1 mi (2 km) of Franciscan Church of the Annunciation and Ljubljana Castle. Preseren Square and Triple Bridge are also within 5 minutes. Ljubljana Station is 12 minutes by foot. Located in Ljubljana City Centre, this hotel is steps away from Preseren Square, Franciscan Church of the Annunciation and Triple Bridge. Ljubljana Town Hall and Congress Square are also within 10 minutes. Ljubljana Station is 9 minutes by foot. 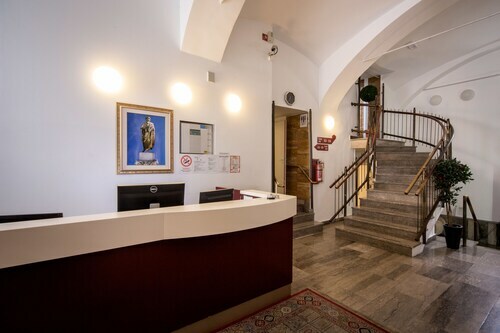 Located in Ljubljana City Centre, this romantic hotel is steps away from Preseren Square, Franciscan Church of the Annunciation and Triple Bridge. Ljubljana Town Hall and Congress Square are also within 10 minutes. Ljubljana Station is 9 minutes by foot. 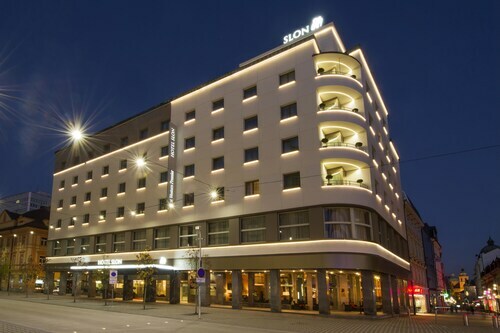 Located in Ljubljana City Centre, this hotel is within 1 mi (2 km) of Preseren Square and Ljubljana Castle. Triple Bridge and Franciscan Church of the Annunciation are also within 5 minutes. Ljubljana Station is 13 minutes by foot. Located in Ljubljana City Centre, this luxury hotel is within a 10-minute walk of Ljubljana Opera House, National Gallery of Slovenia and Preseren Square. Triple Bridge and Dragon Bridge are also within 15 minutes. Ljubljana Station is 9 minutes by foot. This family-friendly Ljubljana hotel is located near the airport, within 3 mi (5 km) of Ljubljana Zoo, New Market and Tivoli Castle. Cankarjev dom Cultural and Congress Centre and National Gallery of Slovenia are also within 3 miles (5 km).